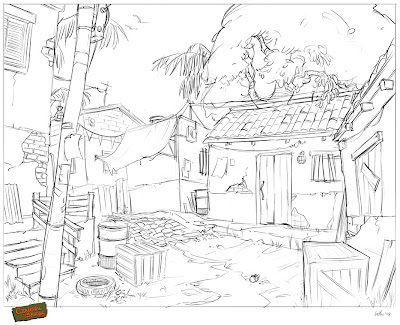 Another sketch of the little Mexican village where my story opens. Dudes and dudettes, if you ever think, "hmm, he could've done that better ..." or anything along those lines please by all means leave me that bit of criticism. I'll take all the help I can get. Happy new year by the way and a belated merry Christmas for those who celebrate with me! criticism?! who the hell is gonna critique you? anybody who looks at this blog is lookin' in complete awe....there's no criticism......you're a crazy person. Anyway, lovin the mexican town. I belong to the group of people that can offer you neither help or criticism. I only know that your drawings I do like. Hi Hethe! I'm not sure if you remember me, but my name is Heidi and I worked with you at Petsmart eons ago. I've been checking out your artwork evey so often these past few years and it never ceases to amaze me just how much you grow every time! So many of your pieces are down-right incredible! You've come up with some fantastic characters as well! wow, love your work- inspriring! gorgeous work! you are at your best when you bullseye the lighting! glad I found this pirate haven. wow... I've been checking your artwork and all I can say is "Wow"... incredible stuff! Btw, I featured one of your sketches on a blog of mine, Drawn In Black, I hope you don't mind. If so, drop me a line and I'll take it down. those color sketches are amazing! Say, do you use a wacom Intuos, or maybe Cintiq? Tortugamarina, I use a wacom intuos yes. Wouldn't paint on the computer without one of those. Heidi! Of course I remember you. I remember everybody there, it's not like we didn't spend almost every day together washing stinky dogs. Thanks for the kind words. Hope you are doing well! Email me from the email link on my site and let me know what you've been up to since I quit. I quite like your drawings. I personally use an Intuos 4 as well. Though I need a bigger size because my current tablet is small for my screen.